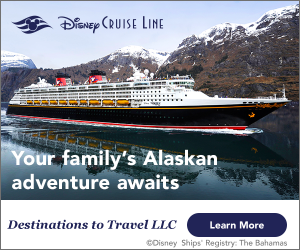 What could be better than a delicious meal full of unlimited Mickey waffles, a great view over Bay Lake, and a visit from everyone’s favorite Mouse? Nothing! 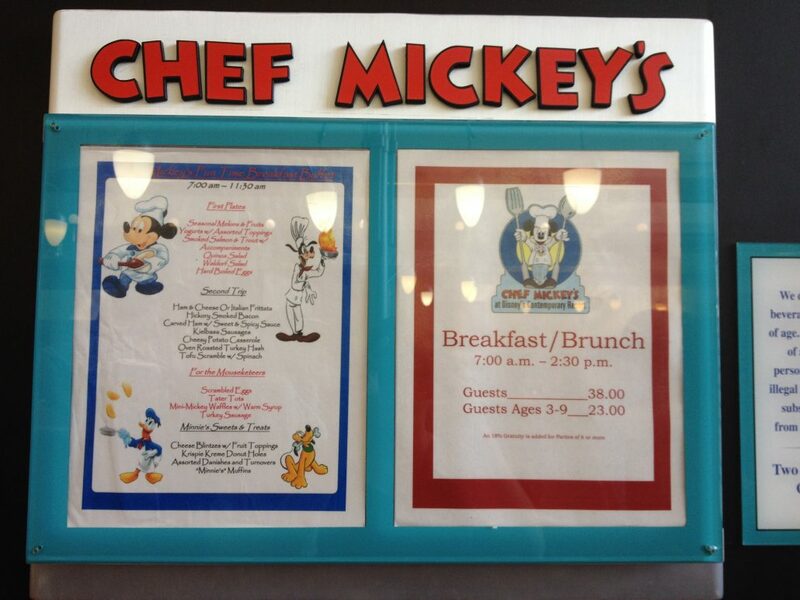 So head on over to Chef Mickey’s and let the fun begin! Today we welcome guest reviewer Katie Prevot from Destinations to Travel with a review of Chef Mickey’s at Disney’s Contemporary Resort! Take it away, Katie! Looking for the perfect picture of a Disney restaurant has a monorail overhead, Mickey & his friends saying “HI!” and great food? 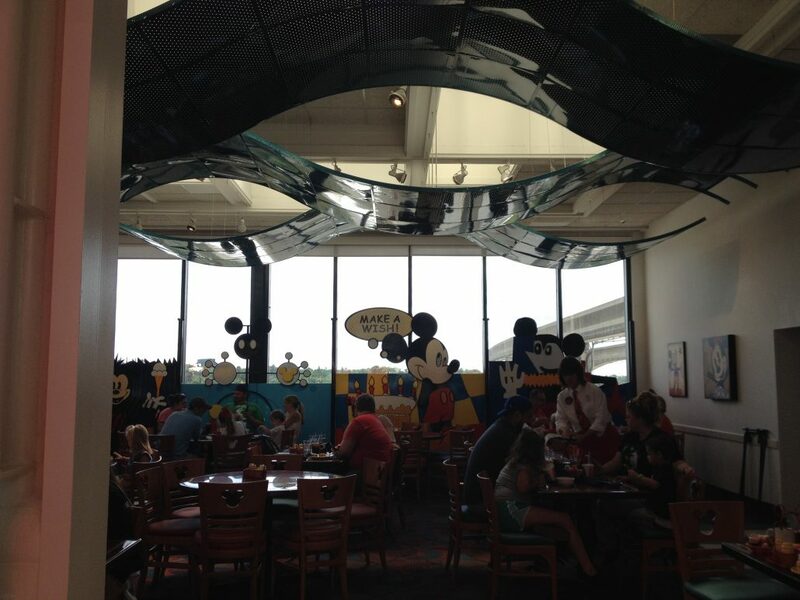 Find all of that and more when you dine at Chef Mickey’s at the Contemporary! When you arrive at the Contemporary you can feel the excitement and electricity in the air. 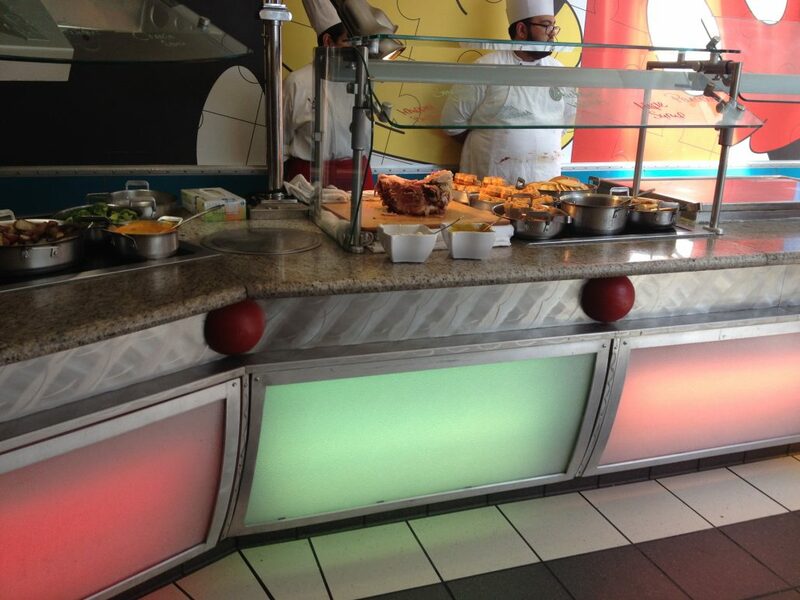 Take the escalator to the second floor – you cannot miss that huge Chef Mickey’s sign. When you go to check in for your reservation you will get a cute little buzzer with trivia on it, which is always one of my favorite parts of the experience. Next, you will get a photo by a Photopass photographer, standing next to a huge plate with a little Mickey and his fruit salad. I love this photo, and the kids always like to look into Mickey’s bowl. Even if you have a short wait till your meal, you get to lookout at the wonderful Bay Lake scenery from the large windows and even see boats and water skis go by sometimes. There are four different seating areas in the restaurant – large parties will often be put in the room past the buffet bar or in the room straight back with the large windows and cool art painting. I have gotten seated at the front corner, the large room area, and this last time I sat in the middle right next to the buffet bar. Now our table was right next to the kitchen door, and I thought this would be a pain but it ended up being just fine. The number one thing about eating here is of course seeing the monorail while you eat! It is just another amazing aspect to this wonderful place. 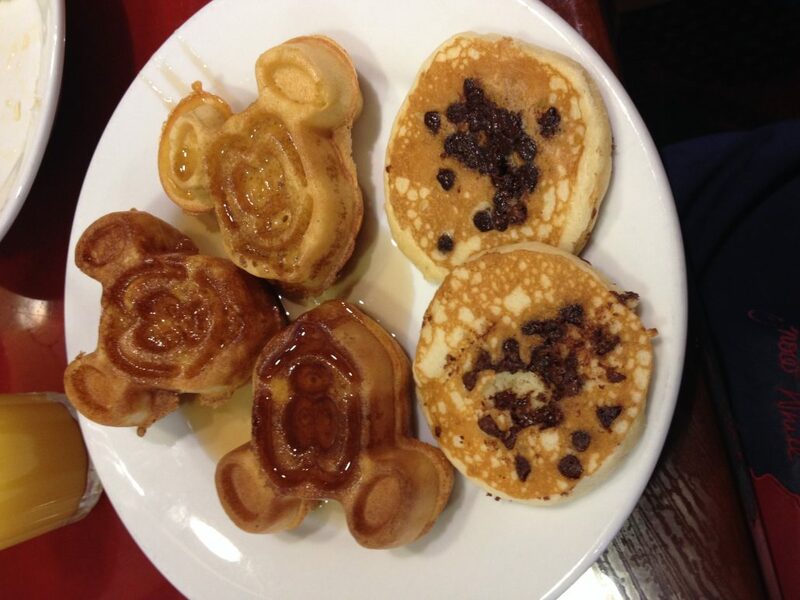 I think of Chef Mickey’s as home of the Mickey Waffles! They have tons and tons of them. I think I counted 6 different spts that had them. I don’t know about you, but I could eat Mickey waffles all day! But this restaurant is for more than just waffles — they offer three meals a day including breakfast, brunch & dinner. I love eating brunch here because it has the breakfast items that I love, but at a later time. 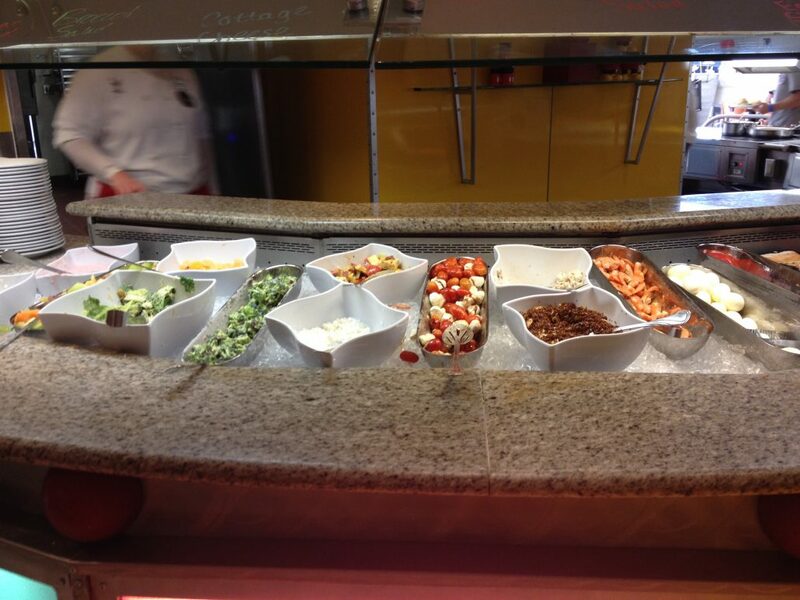 Brunch also offers everyone different options like salmon, salad, shrimp, yogurt bar, soup, sausage, ham, ribs, & a lot more. Dessert is a winner here too, the dessert bar is filled with make your own soft serve ice cream and all kinds of goodies that will make your mouth water. While Mickey and the gang are walking around seeing everyone, every so often they have a dance party where all the kids and adults to get up twirl their napkins. It is so much fun to see and even the characters will be there to dance along with you! Besides the fun dance parties and great fun, keep your eye on the gang because they happen to do some really cute things. While I thought sitting by the kitchen door was going to be bothersome it was actually quite hilarious. 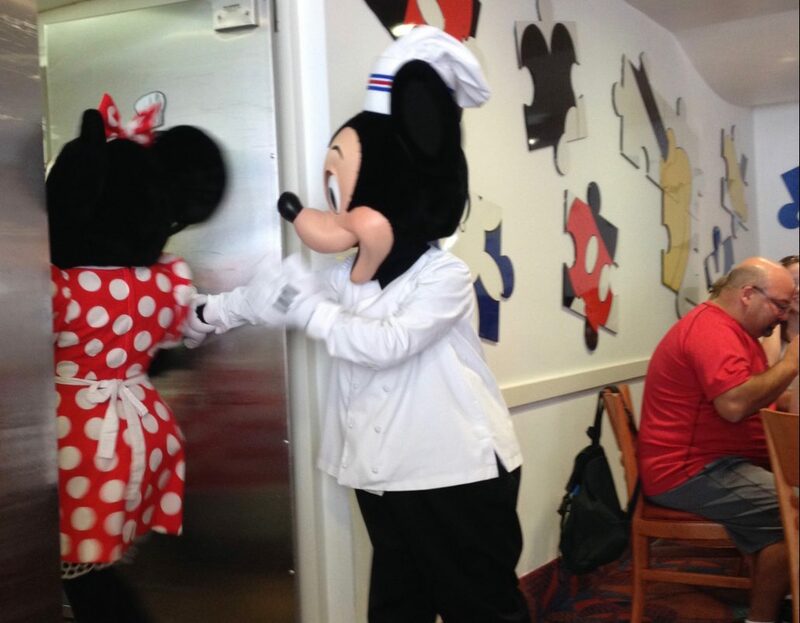 Every time Mickey and his friends would enter through the doors they would do some cute scene whether it was goofy slipping and falling on my 5yr old, Mickey holding the door open for Minnie and giving her a kiss, or Donald fussing at the staff. If you’re on the Disney Dining Plan, it will only cost you 1 Table Service Credit per person to dine here. It’s definitely recommended that you make an Advanced Dining Reservation at Chef Mickey’s, it fills up fast on 180 days out. It is a good choice for those who are looking for a great Disney restaurant with the best food at every meal, and to see Mickey & friends.